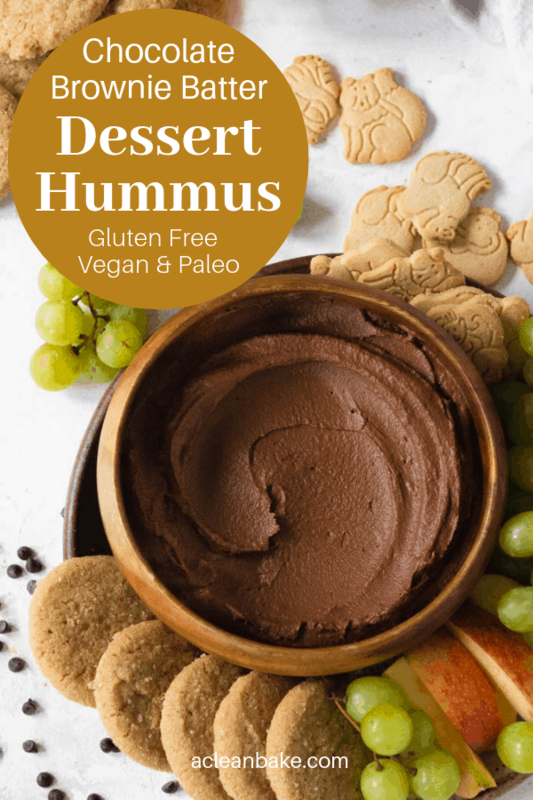 Dessert hummus is all the rage these days! This chocolate brownie batter variety is one of the originals: a chocolate, chickpea-based dip that is a great party snack! My version offers a legume-free variation, too, in case you don’t tolerate chickpeas. This creative dip is for everyone! This is an OG ACB recipe. That means it’s been on my site since, basically, the dark ages, when I was still in the process of identifying the foods I don’t tolerate. I had gone gluten free, but was still in denial about how legumes affect me, so chickpeas were still on the menu. 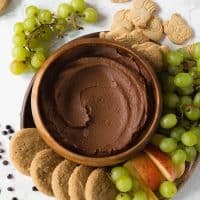 I originally called this “secretly-healthy brownie batter dip” because, at the time, people weren’t nutritionally woke enough to be ready for the idea chocolate hummus. They were still side-eyeing black bean brownies a little; I wasn’t going to push my luck. “I detest labels like lightened-up, skinny, and, yes, secretly-healthy. As you probably already figured out, I strongly object to the concept that healthy and delicious or indulgent are mutually exclusive and I don’t think you need to trick people into eating healthier. Technically speaking, I guess it’s nothing. But if we’re giving ourself a little leeway, it’s a sweet version of hummus. Technically speaking, hummus is a thousands-of-years-old method of blending chickpeas (garbanzo beans), tahini, lemon, and some herbs and spices into a lusciously smooth, savory dip. But you probably already knew that. I looked tradition in the eye and said: “you know, this could use some chocolate”, because really, what can’t? 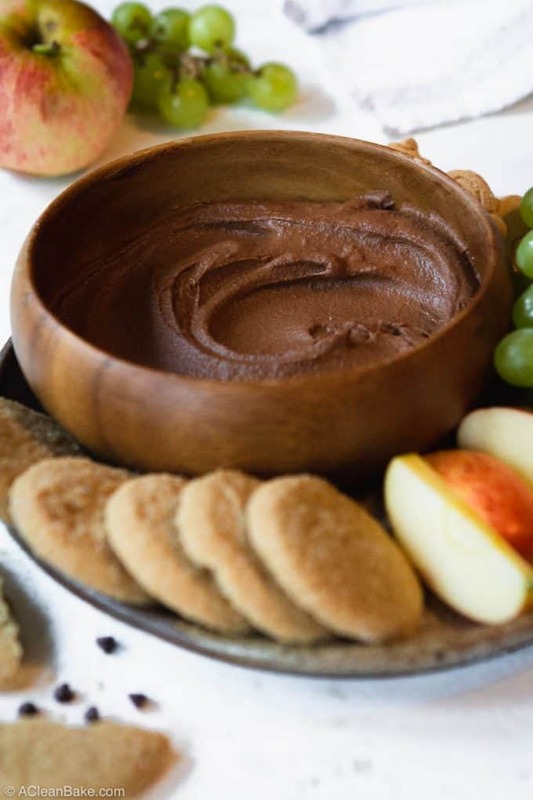 So, dessert hummus is a sweet dip inspired by the savory original, consisting of chickpeas, tahini, unsweetened cocoa powder, honey (or you can use maple syrup to keep it vegan), vanilla extract, and sea salt. Just like the original, it is easy to make in the food processor, rich, silky smooth, and tantalizingly dunk-able. The Original Dessert Hummus Recipe? Well, One of Them, Anyway. Ok, I want to be clear: I’m not claiming that I invented dessert hummus. Maybe someone somewhere thought to throw some cocoa powder in the food processor before I did. I’m sure I’m not literally the first person, but I know I was one of the first to put a recipe for it online. Now, it’s a huge food trend. In addition to the original, there are lots of copycat products being sold in the grocery store, in flavors for everyone: snickerdoodle hummus! peanut butter hummus! cookie dough hummus! The possibilities are endless. I had a THREE YEAR head start. Yes, it’s safe to say that I am kicking myself. But I digress. I just want to make it clear upfront that this is an original concept, not a copy of the packaged stuff (especially since the packaged stuff contains something called cultured dextrose; mine is, of course, all natural!). Ok, I just had to get that out of the way. Now we can move on. The recipe is naturally gluten free and dairy free, but you can make it paleo-friendly, too. Chickpeas, aka garbanzo beans, are part of the legume family, so they are forbidden on the paleo diet. Labels aside, though, they can be tough to digest for anyone. But don’t worry: I’ve prepared with a legume free (paleo) version of this dessert hummus that is just as smooth, creamy, and chocolatey. Do you know what makes a fabulous replacement for garbanzo beans in hummus? Steamed sweet potato! Cool, right? I know! I was so excited when I figured that out. I think we can all agree that this is a reasonably healthy dip, right? It may look and taste decadent, but it’s full of healthy fats, fiber (either from the chickpeas, or the sweet potato), and antioxidant cocoa powder, plus it is low in sugar. That it straddles the line between “healthy” and “dessert” means that there are lots of ways to serve this dip. 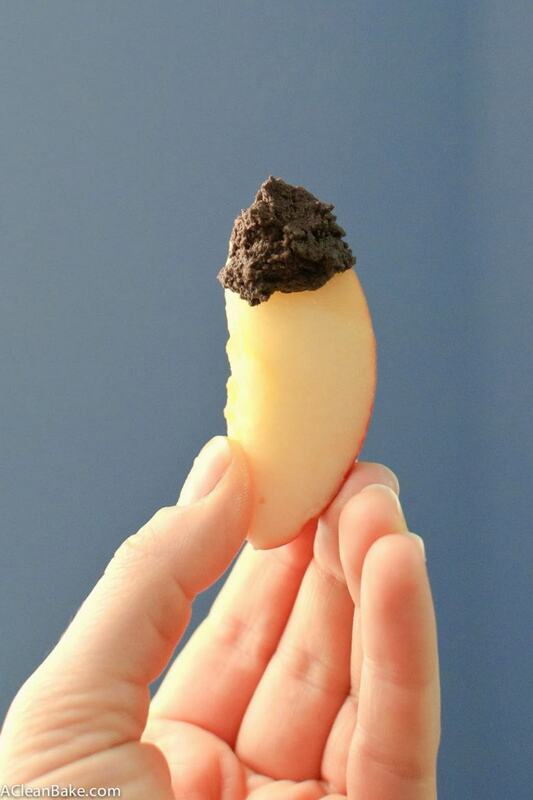 It works well as a snack, topped with crushed walnuts and nestled beside a pile of apple slices. 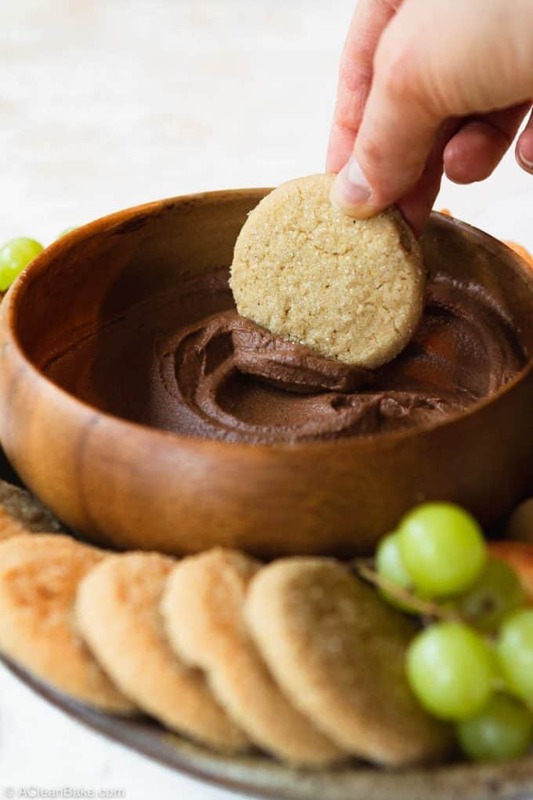 But it also works equally well as a decadent after-meal treat, topped with dark chocolate chips or sandwiched between two cookies (gluten free graham crackers make an excellent vehicle for this hummus). You could also use it as a topping for ice cream or yogurt, or anything else that a creamy dark chocolate-y flavor would complement. If you’re using the sweet potato version, the flavor is going to be sliiiiiightly different than if you were using garbanzo beans. It’s a little bit more vegetal, but you probably won’t notice after the first bite. 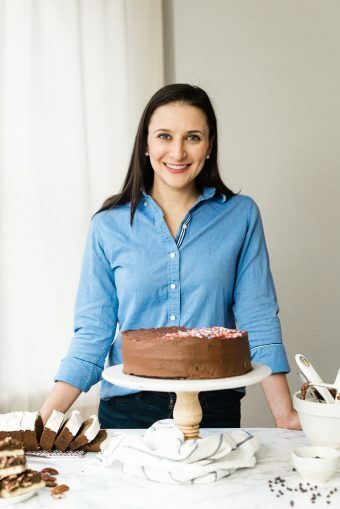 If it really bothers you, add a little more cocoa powder (1-2 tablespoons), and as much additional maple syrup or honey as it takes to get to your preferred sweetness and consistency. You can also try adding an extra dash of vanilla extract (no more than 1/4 teaspoon) or even a bit of vanilla bean paste, if you are fancy enough to have it handy. If your hummus is too thick for your preferences, you can thin it out using a tablespoon or two of full fat (canned) coconut milk, or a neutral-flavored oil, such as avocado oil. Do not use coconut oil, which is solid at room temperature, so will make the texture of the hummus too thick, or even weirdly chunky. Sweetness is a preference, so don’t be afraid to add a little more maple syrup or honey to your food processor as you blend, until sweetened to your preference. However, remember that adding more liquid (say, from maple syrup or honey) will thin out the dip. So, as you can see, this recipe is quick and easy to make and very adaptable to make it exactly how you like it! Now it’s your turn to try it for yourself. Dessert hummus is all the rage these days! 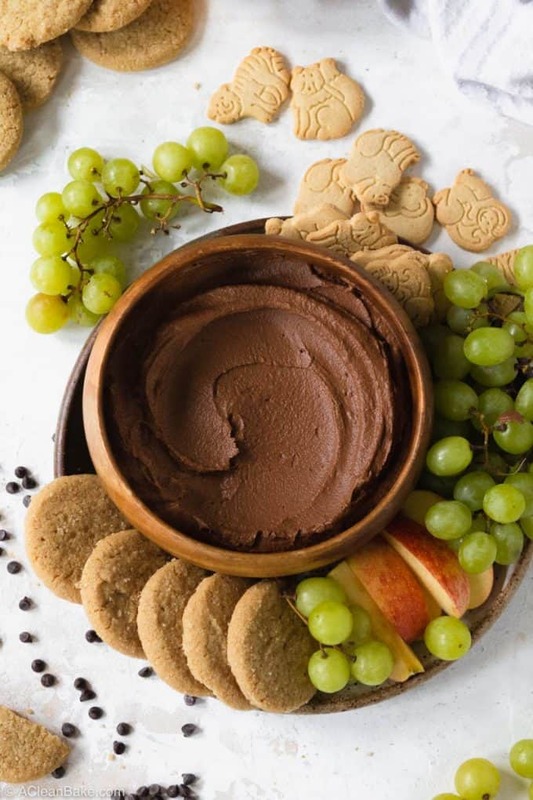 This is one of the originals: a chocolate, chickpea-based brownie batter dip (with a legume-free variation) that is a great party snack or festive dessert! Add all ingredients to the bowl of a food processor fitted with the "s" blade. Process until smooth, adding more tahini or a neutral oil (see note) to thin out, if you prefer. If you're using chickpeas, it is easiest to use canned, rather than cooking your own. Look for a low-sodium, BPA-free variety, and rinse them thoroughly before using. If you're using sweet potatoes: peel, and chop into 1" cubes. Then boil or steam until extremely soft. They should be so soft that they're difficult to handle and your finger sinks into them when you press them with a little bit of force. Cool completely before using in this hummus. You can prep the sweet potatoes up to 3 days in advance of making the hummus. If you are not familiar with tahini, it is sesame seed paste (think of peanut butter, but made with sesame seeds instead of peanuts) that is available at health food stores, some supermarkets, and online. This is my favorite brand. You may need 1-2 tablespoons less of maple syrup if you're using the sweet potatoes instead of chickpeas (since they have some sweetness in and of themselves). In general, sweetness is a preference, so don't be afraid to add a little more maple syrup or honey to your food processor as you blend, until sweetened to your preference. However, remember that adding more liquid (say, from maple syrup or honey) will thin out the dip. If you're using the sweet potato version, the flavor is going to be sliiiiiightly different than if you were using garbanzo beans. It's a little bit more vegetal, but you probably won't notice after the first bite. If it really bothers you, add a little more cocoa powder (1-2 tablespoons), and (if you want) as much additional maple syrup or honey as it takes to get to your preferred sweetness and consistency. You can also try adding an extra dash of vanilla extract (no more than 1/4 teaspoon) or even a bit of vanilla bean paste, if you are fancy enough to have it handy. Hummus is best within 24 hours of preparation. If you need to keep it for longer, freeze it in an airtight container and allow it to thaw to room temperature on the countertop before serving. Nutrition information does not include any toppings or serving vehicles (like fruit or cookies). This recipe has been updated. It was was originally published on August 21, 2014. I don’t even think I was the first tho! Yours is so pretty. Yay for oldie but goody recipes! Ah, I knew there must have been someone else out there who thought of it before me! We should have teamed up and gone on Shark Tank!